Located in the remote East Kimberley region of Western Australia, the Argyle mine produces approximately 0.1% of the world's diamonds supply, and roughly 90% of the globe's rare pink diamonds. The mine provides white, champagne, and pink diamonds as well as some other very rare colors. The mine itself is a wonder since its success and high production rate over the past 30 years is unprecedented. 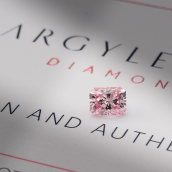 As a result, Argyle has made quite the name for itself and its products, namely the extremely valuable and popular signature stone, the Argyle Pink Diamond. It is for this reason that diamond collectors and investors follow the Argyle mine closely. 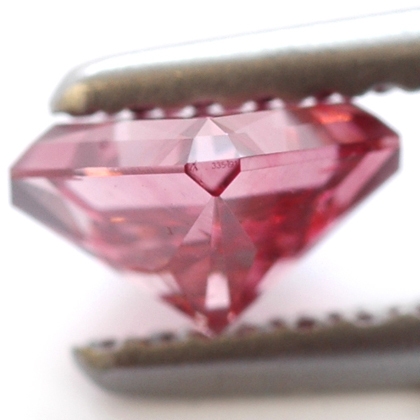 Argyle Pink Diamonds are recognized as some of the most concentrated forms of wealth on the planet and therefore present unique investment opportunities and advantages over other traditional investments such as stocks, bonds and precious metals. Josephine Archer, the Argyle Pink Diamond Business Manager, said that "Although the Argyle mine supplies approximately 90% of the world's pink diamonds, astonishingly, a whole year's worth of production of stones over half a carat would fit in the palm of your hand." This goes to show just how rare these beautiful stones really are. "The chances of any future mine discovery replicating the unique properties of the Argyle mine is extremely low," said Archer. "Currently there are no other pink diamond mines or deposits, and even if another deposit of pink diamond-bearing ore is discovered, it takes an average of 10 years for a mine to proceed from discovery to production." 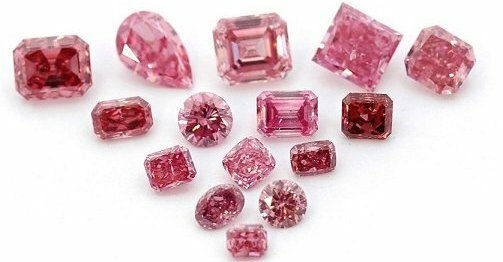 The rare pink diamonds produced from the Argyle mine range from Red to Pink to Purplish Pink to Pink to Pink Rose to Pink Champagne to Violet and many more exquisite shades of color. The Argyle mine lies 2,500 kilometers from the Australian city of Perth, the capital of Western Australia. The mine began its operations in 1985 and has changed the world of diamonds, and pink diamonds in particular, ever since. Approximately 20 million carats of diamonds are produced annually at the mine, but less than a mere 0.1% of them are pink diamonds. In 2009, it was estimated that the mine's life span would remain only 10 more years, and Argyle has confirmed this in their own publications. This means general production is believed to end in 2019. There has never before been, and will probably never be again, a mine that replicates these unique properties as productive and successful as the Argyle mine. Controlled by Rio-Tinto, the world's third largest mining company, the mine produces approximately 35 million carats of rough diamonds annually, but only 5% are considered gem quality. 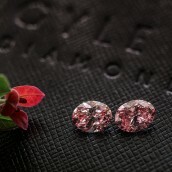 Furthermore, less than 2% of all color diamonds mined at the Argyle mine can be certified as pink diamonds. Argyle diamonds are known throughout the world to show fantastic colors and retain unbelievable value. In fact, these stones can sometimes reach almost twice the amount of a similarly beautiful pink diamond mined elsewhere. 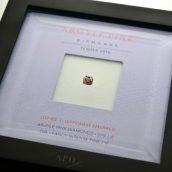 Argyle invested a lot of work into branding their pink diamond unit, as they quickly recognized the potential that these stones held. They developed their own color grading system and after thoroughly assessing the diamonds they note their color and clarity grade in their own Argyle Certificate. Furthermore, the Argyle mine laser inscribes the diamonds sold through their business unit in order to verify the stones authenticity. Argyle diamonds are highly sought after by both collectors and investors as a result of their beauty and their ability to retain value. Especially since the mine is said to close down by 2018, the demand for these stones is very high, which will ease an investor's challenge of liquidating these assets in the future. 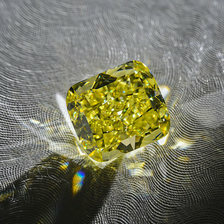 One of the most fascinating aspects of fancy color diamonds is the cause for its unique color. 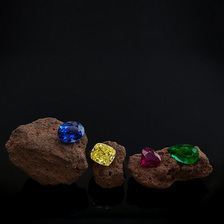 Color diamonds owe their colors to various elements within the compound structure. The cause for the pink color in natural fancy pink diamonds however still remains a mystery. It is largely assumed to be the result of the extraordinary pressure beneath the Earth's surface that the stones were forced to endure over a tremendous amount of time. The pressure brought the stones closer to the surface, thereby altering their structure and making them refract light and produce color. 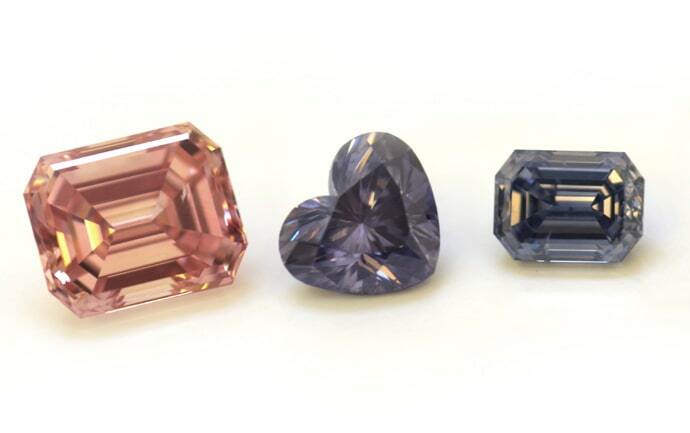 Though it is rare, blue and violet diamonds are also sometimes found in the Argyle mine. Violet diamonds are believed to receive their color in a similar manner except that additional trace element alters their color even more, however this again is merely everyone's best guess. Color is only one of the 4Cs, and like colorless diamonds, all four apply, although with fancy colored diamonds nothing is as important as the diamonds color. The color intensity and rarity of the color can elevate a diamond's value significantly. 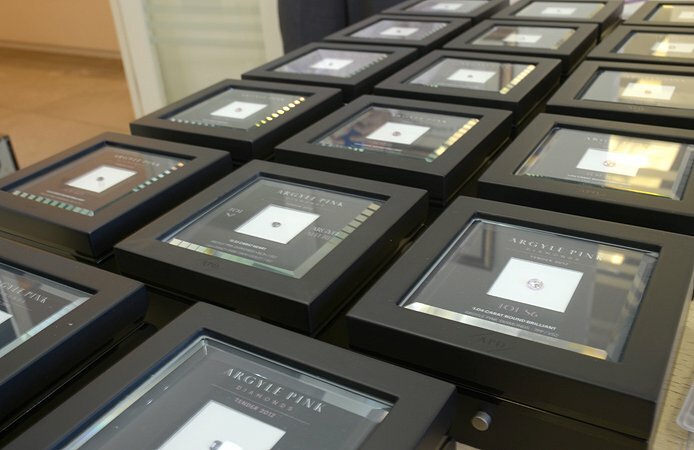 The Argyle Tender is an exclusive and posh annual event that showcases the most exceptional Argyle Pink Diamonds mined each year. The invitation only Tender presents a unique opportunity for approximately 200 hand selected diamontaires to bid on 40 to 70 signature stones that are otherwise publicly unavailable. "Argyle Pink Tender Diamonds are literally one in a million, as for every one million carats of rough diamonds produced from the mine, only one polished carat is offered for sale at the Tender" says Rio Tinto's Argyle Diamond company. Even since the Argyle Pink Diamond Tender began, the stones offered were revered throughout as extremely valuable items. 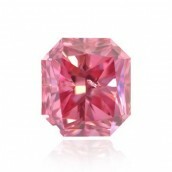 Early on in the 1980s, the London Jeweler, Laurence Graff, purchased the entire Argyle Pink Diamond Tender collection. Graff later used the whole collection to create a contemporary version of the 18th century Tremblant flower. It is said that literally just a few hours after the piece was completed, it sold to one of the most well known colored diamond collectors, the Sultan of Brunei. Leibish & Co. is pleased to be of the few selected to attend this tender, and in turn has made quite a dominating appearance after winning 17 tender diamonds in 2012, six tender diamonds in 2011, six in 2010, and one in 2009. 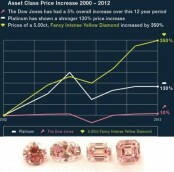 More and more investors are turning Various Fancy Color Diamonds and specifically to Argyle Pink Diamonds for investment purposes. Due to their beauty, rarity, and impending extinction, the prices of these stones continuing to rise. The Argyle Pink Diamond specifically has been dubbed 'the most concentrated form of wealth on Earth.' "It is their rarity that plays in the dominant role in driving the prices of Argyle pink diamonds to new heights," said Josephine Archer. When Rebecca Pickering, one of the Argyle Diamond Mine chief engineers, was asked about the rarity of these stones, she said "only 1% of our production is pink diamonds. So for every 4 Olympic swimming pools of rocks we crash we get half a bucket of diamonds, and within that half, only a teaspoon of pink diamonds." The Argyle mine may be the largest source for pink diamonds that the world has ever seen and will ever see, but there are only so many pink diamonds to be found. The rarity of Pink Argyle Diamonds makes them a hot commodity that is gaining increasing popularity among investors, diamond enthusiasts, and celebrities alike. Regardless of whether or not the Argyle mine will shut its doors in the next few years, one thing is certain; the Argyle mine has become much more than just a diamond mine but rather, a timeless diamond empire that will be remembered for eternity.